With the new teams came new logos and hats, which clearly need to be ranked. Here is my descending list of Rockies affiliates based on their branding. The Grand Junction Rockies used to be the Casper Ghosts. Yes, the Casper Ghosts. In one quick move from Wyoming to the Western Slope in 2012, the team went from one of the best names in the organization to the worst. Boring. Boring. Boring. 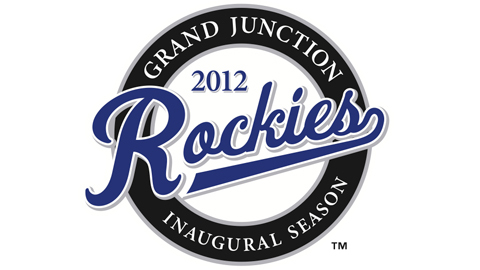 The logo is the Colorado Rockies logo with a mesa on it instead of a mountain. I understand the desire to associate your gateway team to your major league team as it provides those newly drafted players their first taste of professional baseball. However, they did not need to make a carbon copy of the Rockies look. Even their inaugural season special logo is bland. This logo has nothing to it. Ugh. To compare, this is what the Casper Ghosts brought to the table. Neon colors and a seamed ghoul? Different and way better. The main logo of the Boise Hawks is not terribly exciting. Orange bird holding a bat with red accents and some nice script. Nothing great, but nothing terrible either. That being said. . .
. . . the Hawks excel with their alternate lids. Talons ripping through the face of the crown? Talons ensnaring a hardball? Those are pretty cool. It is too bad all of their brand isn't this clean. Asheville used to have an amazing logo of a traveling bear in a Hawaiian shirt. My best friend's dad wore his Tourists hat all the time and it was awesome. In 2010, they remade their brand and incorporated the moon into their design. The moon theme was a throwback to the original baseball team in Asheville - the Moonshiners. While this logo probably is better than its fourth place finish, my judgement is jaded by the absence of that sweet traveling Ted E. Bear. Look at how touristy that bear looks. I love the Isotopes' logo. The A made to look like an atom with a baseball electron stands out. While the script "Isotopes" beneath the logo could have dropped their ranking a bit lower (no way it was dropping below GJR), the cap is slick. The hat alone produced a podium finish for Homer Simpson's team. The newest addition to the Rockies baseball family, the Yard Goats combined their local sports history, their long-standing area railroad traditions, and a fun social media presence to build a fantastic brand in only a few months. The name comes from a rich railroad history in the Hartford area. Yard goats are locomotives that are used to move cars around a rail yard. The colors (and hype song) for the logo came directly from the last professional team to reside in Connecticut's capital, the Hartford Whalers (who had their own top-notch logo). The goat logo is cool enough by itself, then you throw in the horned H and YG text logos. All in all, this is a brand I can get behind. I already have convinced the wife that a Yard Goats hat is coming my way come birthday time. After much hand-wringing and internal arguments, the Yard Goats ultimately fell to the Modesto Nuts. The walnut road alternate hat was my first minor league cap purchase. If you see me wearing a hat, there is a high probability that Wally the Walnut is perched on my giant dome. I like the black/red/brown combo and the use of the dual mascots. This brand's simplicity and overall quality make it the top brand in the Rockies minor league system.